"The World that Panics Made"
When did America see a complex chain of debt linking risky consumer loans with fragile banks? That was 2008, but it was also 1819, 1837, 1857, and 1893. Legum Professor of History Scott Reynolds Nelson will show how America's history has been filled with stories about failing loans, broken banks, fractured families, and partisan finger pointing. He'll outline what panics are, how to predict them, and how they have radically reshaped American politics. 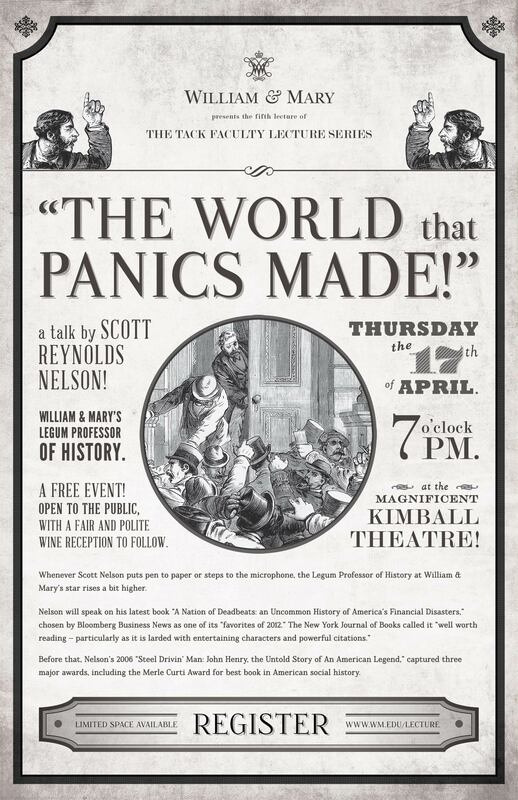 Scott Nelson, W&M professor of history, concludes his faculty lecture "The World that Panics Made!" on April 17, 2014.